Whitening your smile is a great way to improve your appearance and give you the confidence you need to conquer the day. Over the counter products can’t match the power of professional whitening, the science of advanced formulas or the security of knowing your dental professional has the knowledge to make whitening its safest. Only your dental professional has access to the most powerful professional- strength products for whitening. At our office we offer two exceptional options for tooth whitening. You can choose either an In-Office Zoom tooth whitening procedure or a professional Take-Home System. Both are top-of-the-line systems. In less than 1-hour Philips Zoom WhiteSpeed is clinically proven to whiten your teeth up to 8 shades. During the entire procedure, a plastic retractor will be placed in the mouth to help keep it open. Lips, gums, cheeks and tongue will be covered to ensure they are not exposed to either the gel or light. The clinician applies the whitening gel and the teeth are exposed to the light from the Zoom lamp for three 15-min sessions. There is an optional fourth session for those with dark stains. A visible LED light filter will be provided for eyes protection. Following the procedure, desensitizer/fluoride treatment is applied to provide remineralization and prevent tooth sensitivity. Take-home trays with whitening gel will be provided after treatment for maximum results and maintenance. If you want instant gratification, this is your best choice. Our professional strength take home system also produces excellent results. However, this is achieved by way of a more gradual process. The treatment begins by having impressions of your teeth taken for the fabrication of custom whitening trays. The trays are made of a clear plastic that comfortably adjust when inserted. A small amount of the whitening gel (carbamide peroxide or hydrogen peroxide) is placed in each tray, and the time period they must remain on your teeth can vary according to your teeth whitening needs and the dentist ‘s advice. After they have been used and are taken off, they should be cleaned with a Q-tip or a cloth and rinsed. These whitening trays can be used several times to achieve the desire results. Our Take-Home kit may be prescribed alone, or after an In-Ofice Zoom treatment to perfect or maintain the In-Office results. 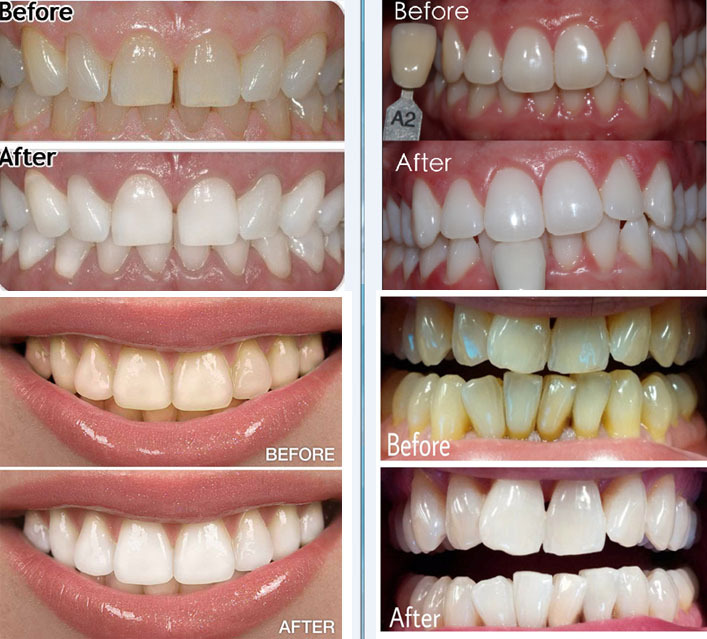 The end results whether using the Trays At-Home or having In-Office Whitening is the same: A beautiful and radiant smile! !